A new report from Cientifica Research, Nanotechnology, Smart Textiles & Wearables, analyses the markets and technologies that are driving the shift to smart textiles. 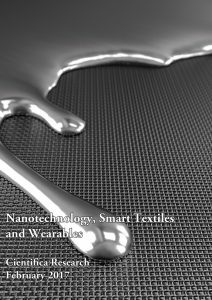 Nanotechnology, Smart Textiles & Wearables is the most up to date and comprehensive look at the sector and its 207 pages discuss over 250 companies active in the space. The past twenty years has seen the rapid introduction of nanomaterials into a wide variety of textile processes, from anti stain and wrinkle finishings to nanofibre wound care. This has opened up new markets for nanomaterials suppliers and textile producers alike. While some of these products have been on the market since the early 2000’s, for example Nano-Tex coatings, others such as conducting coatings for fibres or graphene coatings for nonwovens are only just emerging. Cientifica has been monitoring nanotechnology and smart textiles for over a decade and the report ranges from the latest advances in wearables to the use of nanofibers in dust and water filtration.